Learn to play Guitar with Resonate Music Guitar Lessons! 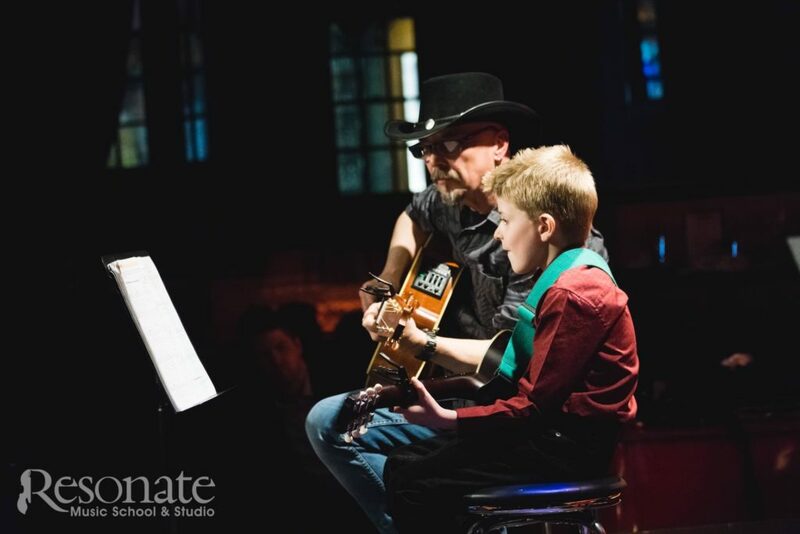 Resonate offers private 30 minute and 60-minute guitar lessons for those ages 5 and older. Our guitar lessons are customized by a Certified Resonate guitar teacher to be personally suited to each individual student’s skill level and goals. If you’d like to take a few lessons before buying your own guitar, feel free to use one of ours during your lessons. Since every guitar has it’s own unique feel, we recommend bringing in the guitar you’re going to be practicing with most often. At Resonate, lessons are available seven days of the week, all year ’round. There’s no term or school year which means no contract. You can get started whenever you want and finish whenever you want. Take it one month at a time for as long or as little as you’d like! A New Way To Learn Music. This is why we were the first music school to launch a comprehensive membership program. The Resonate Memebership Plan offers students an opportunity to devote themselves to learning music within a consistent yet flexible schedule. Its central purpose is to engage, inspire, and reward our students. By continuing year-round, this Plan eliminates time spent re-familiarizing students with material forgotten over lengthy breaks between terms, allowing for efficient and accelerated progress. Unlimited Make-up Lessons – to ensure that no missed lesson becomes a lost lesson. Complimentary Recording Studio Time – with a certified engineer and producer so our students could enjoy the unique process of music creation first hand. Satisfaction Guarentee – to assure students that we are accountable and give them the opportunity to try us out risk-free. We’ve done all of this and more when we could’ve just offered the same experience that’s been available for years. Why? Simple. Because we put YOU first. If you’re ready to get started, one of our team members is waiting to match you with the best fit for your schedule and your stylistic preferences.